Off of her 2018 album Clean. Sophie Allison A.K.A. Soccer Mommy has just shared a new music video for the 2018 Clean album cut "Scorpio Rising." Jumping on Twitter this morning, the singer shared a clip from the visual along with a short message. Watch the clip now via Apple Music. 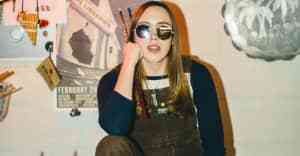 The short teaser clip sees sees Soccer Mommy treading along (with a mic in hand) what looks to be a field surrounded by tall grass; the blue-tinted visual is lit up by a bright stage light. Check out the preview above, and with your Apple Music membership handy, you can watch the video here. Thumbnail image courtesy of Lindsey Grace Whiddon for FADER.